YANGON, Myanmar -- More than three years after houses and properties were destroyed by a mob in an anti-Muslim riot in Myanmar’s central town of Meikhtila, many Muslims are still unable to go home. Nationalist groups oppose their return following the large-scale communal violence of 2013 between Muslims and Buddhists that left dozens dead and more than a thousand displaced. Talking to Anadolu Agency on Monday, Muslim lawyer Aung Thein -- a spokesman for the Interfaith Friendship Network in Meikhtila -- said at least 70 Muslim families remain homeless. “Since the authority closed [IDP] camps [they were place in after the rioting] earlier this year, they have been sheltering in monasteries and playgrounds in the town,” Aung Thein said by phone. He added that the families have been trying to return to their homes for years, but authorities had not accepted their request as local nationalist groups opposed the move. Meikhtila is a stronghold of the nationalist monk-led Association for the Protection of Race and Religion (better known as Ma Ba Tha). For years, anti-Muslim rhetoric from the group -- in particular from prominent member Wirathu -- has been seen as deliberately stoking the flames of religious hatred against the country's Muslims, with Wirathu blaming them for communal conflicts, and accusing them of attempting to Islamize the country of 57 million people. “Now many of them [the Muslim population] are trying to sell their land and properties to move to another places," Aung Thein underlined. On March 20, 2013, a mob destroyed a gold shop following an argument between a Muslim gold shop owner family and a Buddhist customer over a golden hairpin. Police tried to disperse the mob, however the situation became uncontrollable after a monk was killed and burnt alive later that day. The situation quickly descended into three days of bloodshed, arson and looting, which left 43 people dead, most of them Muslims, houses reduced to ashes, and around 12,000 people homeless. On Monday, the abbot of Meikhtila's Yadanar Oo monastery -- long sympathetic to the plight of the town's Muslim community -- talked to Anadolu Agency about the mistrust he says still remains between the two groups. “Muslims especially still feel unsafe here,” Withuda said by phone. “Therefore they are moving to other towns, while some are converting to Buddhism." 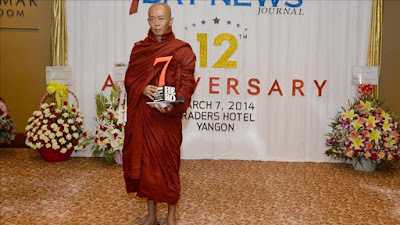 In 2013, Withuda risked his own life to save around 700 Muslims who were hiding in his monastery during the disturbances. Rioters gathered outside and told him to send out the Muslims. “I told the rioters that if you want to kill them you will have to kill me first,” he recalled.